Aaron Sorkin is back and I for one am glad he is. I greatly enjoyed The West Wing through 7 dramatic seasons. I saw the same promise in Studio 60 on the Sunset Strip but others did not and that show folded after just 22 episodes. Of course, in the meantime I've had movies, The Social Network and Moneyball but it is really the television series where I love his writing. Will this new endeavour pass muster? It is amusing how I even discovered Sorkin was back in the game. On the June 28, 2012 episode of The Colbert Report, Aaron Sorkin was the guest (or is it the victim?) obviously making the rounds of talk shows to plug the new series. 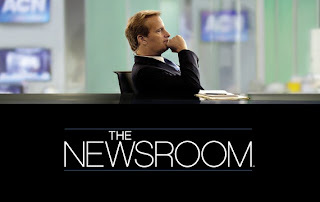 It was great to hear the news about The Newsroom. Stephen interviews Aaron Sorkin. *chuckles* Stephen is quite funny when he goes off on a tangent about Aaron's writing saying Sorkin is pontificating. Will I continue to watch the series? I'm guessing HBO is going to charge for the other episodes and depending on how much I could be persuaded to shell out a couple of bucks. However I'm finding these days that since I don't own a television set, I am watching far less TV. Yes, all the major networks have free offerings over the Net and the quality isn't bad but it's not the same as having a TV set parked in front of a couch. That situation just calls out for you to vegetate. I like Aaron Sorkin. I like his writing style and even if his larger than life characters seemingly pontificate, I somehow think larger than life characters should do and say larger than life things. It goes with the territory. I hope this series turns out to be as successful as The West Wing. HBO certainly has great hopes. The network reportedly renewed the series for a second season after just airing two episodes. I think America needs something like this to spark debate, valid, legitimate debate. In the 1st episode, the main character states that America has not been so polarized since the Civil War. Where is this going to lead? Is America, as the main character says, not the greatest country in the world? (see full speech below) And if not, can it regain its former glory? The Newsroom is an American drama television series created by Aaron Sorkin that premiered on HBO on June 24, 2012. The series chronicles the behind-the-scenes events at the fictional Atlantis Cable News (ACN) channel. It features an ensemble cast including Jeff Daniels as anchor Will McAvoy, who, together with his staff set out to put on a news show "in the face of corporate and commercial obstacles and their own personal entanglements." Aaron Sorkin (born June 9, 1961) is an Academy and Emmy award winning American screenwriter, producer, and playwright, whose works include A Few Good Men, The American President, The West Wing, Sports Night, Studio 60 on the Sunset Strip, Charlie Wilson's War, The Social Network, and Moneyball. YouTube: America is not the greatest country anymore - "The Newsroom"